Interestingly, the two people — Persad-Bissessar and Panday — who had just fought an epic four-week battle for UNC supremacy, both said nothing in the House debate on Friday, and the most significant words were those of Manning. The PM congratulated Persad-Bissessar on “her election to the position as the political leader of her party and to ascending to the ranks of political leadership in the country.” Manning urged Parliament to note Panday’s significant contribution to the country’s development. In the sitting, Chaguanas West MP Jack Warner occupied the seat of Opposition Whip, not Panday’s choice of Oropouche East MP Dr Roodal Moonilal. The Whip is appointed by party leader, not by Leader of the Opposition. 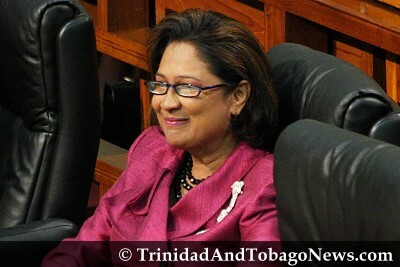 It was a proxy battle for the much greater power-play behind the scenes between Persad-Bissessar and Panday for the post of Leader of the Opposition. The fuzzy remarks of several hitherto Panday loyalist MPs suggest people are quickly calculating the political winds have shifted and might shift allegiance. The Leader of the Opposition is a vital constitutional post, but the sitting saw both Panday and Persad- Bissessar try to downplay the question of which of them should occupy it. 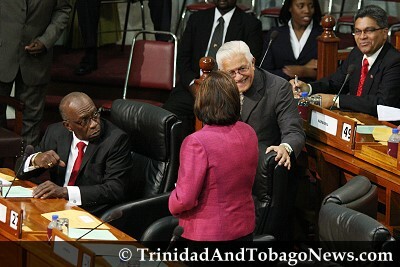 Persad-Bissessar said there is “no haste or hurry,” while Panday, clowning around or being downright facetious according to your view, purported to offer his seat to Persad-Bissessar, who quite sensibly brushed off the gesture. 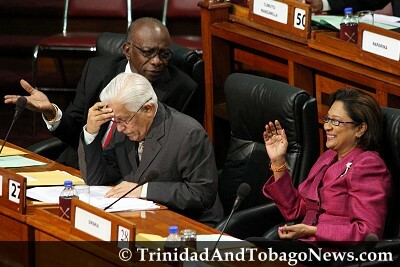 Panday later told reporters, “I offered her my seat since she is so anxious to occupy it”, while Persad-Bissessar told reporters, “Mr Panday is always of good humour”. She won despite an election machinery that to all reports was controlled by the Panday camp. The membership committee under Pro-Panday Couva South MP Kelvin Ramnath rejected 16,000 new applicants, and removed the names of 1,300 UNC members who were alleged to also be COP members. Most of these two classes of UNC members were widely thought to be supporters of Persad- Bissessar who nevertheless still won the vote. Even after all of this on Election Day there was widespread debarring of certain UNC members at polling stations across the country, in a move Kamla voters alleged was a move to muzzle them. In his own Couva North constituency, Mr Panday was verbally abused by angry UNC members, irate at being blocked from voting. Later, at the St Augustine constituency polling station at Tunapuna Hindu School, Newsday heard dozens and dozens of UNC members bitterly complain about being debarred. Irate UNC members turned their anger on Mr Panday at the school. “Why is it only Kamla’s people who can’t get to vote?” shouted one angry woman. After a minute or two, he beat a hasty retreat in his black SUV. Who would have thought that in an Opposition safe seat which the PNM could not even win against a split Opposition in the 2007 general elections, Mr Panday would find himself virtually fleeing angry members of his own party who blamed him for their disenfranchisement? Newsday found the voting process unsatisfactory, a factor that Persad-Bissessar had to overcome in order to win. The presiding officer refused to tell us whether or not they were using a dual list of COP/UNC members to strike off people from the UNC voters list. Another presiding officer could not even tell Newsday the number of names on the voting list for his polling station. A bossy young female attorney who wore no identification, refused to identify her position or her name, chased the Newsday reporter off the premises, employing two police officers to do her bidding. Councillor Khadijah Ameen battled valiantly to try to get people to be allowed to vote. She told Newsday said Khemraj Ramdath of the membership committee had just claimed to candidate Colin Partap that no dual list was being used to strike off names from the membership list. Cllr Ameen said that the day had begun with the use of the membership list as up to Wednesday but that at 9 am some sort of “supplementary list” had arrived, but not been given to the different candidates’ camps at the polling station. She ended up leading a large group of irate members to try to see a presiding officer. People poured out their anguish to Newsday. Cllr Ameen told Newsday she had seen about 40 people turned away at the ballot box in the space of one hour, (and she estimated a similar number of persons would have also left in frustration). This is consistent with Chaguanas West MP Jack Warner’s polling agent who told Newsday that in half hour from 1 pm to 1.25 pm some 15 people had been turned away. Among those telling Newsday they were unable to vote were Roshan Sookdeo, William Pillai, Daswant Anand, Samdaye Mahadeo, Nandlal Sookraj, Michael Mahabir, who all denied being COP members. At El Dorado North Hindu School in Tunapuna came similar allegations of disenfranchisement. Hamlyn Jailal, coordinator for the Kamla slate told Newsday of several people who were UNC life members being disbarred from voting. “It’s 11 am and 150 people have voted at the El Dorado North Hindu School which is a very good voter turnout – the membership listing for Tunapuna is just over 700 – but what is a bit disappointing is that we have had nearly about 100 people who have been turned back.” He said these people whose names are not on the final list include people who became members as recently as last November. Jailal said the Kamla camp in Tunapuna had not received any list of alleged COP voters, to be struck off the UNC voting list, and he didn’t see it as an issue. Among the rejected voters was Mr Kamaludeen Mohammed (not the former Government Minister), who said he is not a COP member but has been a UNC member for the past five or six years. In our half-hour at the Tunapuna polling station, Newsday met two other rejected voters, but whom other sources told Newsday were also registered with the COP. Persad-Bissessar’s win was budded a political “earthquake,” by lecturer Dr Indira Rampersad at a panel discussion on the UNC polls on Thursday at the Sir Arthur Lewis Institute of Social and Economic Studies (SALISES), University of the West Indies, St Augustine. She suggested that the changing population is now no longer prepared to tolerate maximum leadership, and so voted for Persad-Bissessar. She alleged that Panday’s tactics backfired, especially his personal attacks, as she said alcohol and alcoholism are integral aspects of East Indian life. Former UNC Senator Carolyn Seepersad-Bachan said UNC members had voted Persad-Bissessar for the simple expedient of getting back into government. While political scientist Dr Selwyn Ryan saw Persad- Bissessar’s win as a threat to the COP (and to the ruling PNM! ), COP leader Winston Dookeran did not, but instead spoke of building a new political home which could accommodate members of the house of the rising sun, the house of the circle of circles and even those from Balisier House. MND leader Garvin Nicholas said Persad-Bissessar’s win dispelled fears that a woman candidate would be rejected. “All these myths have been proven wrong by a constituency that has shown a level of maturity that few predicted…They are no longer prepared to follow leaders who put self-interest before the interests of the constituents and citizenry”. He hoped such maturity would spread through the society. It’s entirely likely that if the new UNC political leader were male, the deft moves made during the last few days in that party would have been hailed as decisive expressions of leadership and a commitment to positive change. Kamla Persad-Bissessar, the duly and overwhelmingly-elected political leader of that party, is now, instead, being accused of “hounding” Basdeo Panday out of the office of the Opposition Leader and of being “discourteous,” “high-handed” and “almost vindictive‚” in appointing newly-elected UNC chairman Jack Warner to the post of Opposition Chief Whip. These characterisations are, regrettably, likely to be only the start of the kind of male-dominated re-evaluation of the woman who overturned the reality of the Opposition party’s politics. In winning the election by a landslide, drawing almost ten times as many votes as the incumbent, and drawing along with her into office her entire slate of candidates, Persad-Bissessar clearly tapped into the discontent within the party’s rank and file and the state of the Opposition party’s business as it was constituted. SIPARIA MP Kamla Persad-Bissessar probably surprised even herself at the extent of her whopping landslide victory over Couva North MP Basdeo Panday for the UNC leadership last Sunday. She got 13,000 votes to Panday’s 1,300. Persad-Bissessar’s win came after a campaign in which she was bitterly attacked by the Panday camp, who tried to sully her as having a “personal problem.” She won despite an election machinery that to all reports was controlled by the Panday camp. The membership committee under Pro-Panday Couva South MP Kelvin Ramnath rejected 16,000 new applicants, and removed the names of 1,300 UNC members who were alleged to also be COP members. Most of these two classes of UNC members were widely thought to be supporters of Persad- Bissessar who nevertheless still won the vote. Opposition MPs who have not yet given their support to the newly-elected United National Congress Political Leader Kamla Persad-Bissessar are doing so against the will of the people, and should support her if they wish to lengthen their political life. So said Suruj Rambachan, one of the UNC’s newly-elected deputy political leaders yesterday. New political leader Kamla Persad-Bissessar yesterday said many persons who had not supported her during her campaign in the just concluded UNC internal elections are now knocking on her door to be part of the new United National Congress (UNC). The move by newly-elected United National Congress political leader Kamla Persad-Bissessar to appoint Jack Warner as Chief Whip is an act of spite and shows her lack of power, Opposition MP for St Augustine Vasant Bharath said yesterday. This peaceful weekend ended with the news of Mrs Persad-Bissessar’s victory in the UNC’s internal election. This was a case of some of this and less of that, some hope of political challenge and less certainty that the Manning Government can conduct itself free of political risk, the risk of losing an election being the primary restraint on reckless governance. Panday won the race…to the bottom! The election of Mrs Kamla Persad- Bissessar to the post of Political Leader of the UNC has dynamited the politics of the country. The fact that the margin of victory was wide and comprehensive added to the importance of the event. Had the result been closer and more equivocal, certain people might have been tempted to claim that they ‘wuz robbed’ as they have often done in the past.The polls were correct when they asserted that Messrs Panday and Manning were in a ‘race to the bottom.’ Mr Panday got there first. Basdeo Panday shall long be remembered for his outstanding contribution to our politics. In time, they’ll be asking, as a new generation of people ask now about July 27, 1990, ‘Where were you when…?’ Tomorrow’s momentous ‘when’ was last Sunday, the night when the mighty fortress that was the power and the glory of Basdeo Panday was reduced to a heap of rocks, like any Haitian wrought in stone, suddenly brought down to mean earth. In fact, the Sunday Guardian has learnt that a top brass meeting has been planned for Wednesday at Balisier House, to discuss all pertinent issues causing disenchantment in constituencies. Just eight days after the UNC internal elections, Prime Minister Patrick Manning will lead a walkabout today, in Opposition leader Basdeo Panday’s constituency, Couva North. The Oilfield Workers Trade Union has congratulated new UNC Political Leader Kamla Persad-Bissessar on her recent victory. The union’s president Ancel Roget also congratulated the party’s membership for taking a bold and historical step and move away from the traditional culture of voting. In a statement Roget said “the people have spoken.” He said it sent a clear message that people were ready for a new type of politics. He also advised the party’s membership to encourage their respective parliamentary representatives to give their new political leader their unequivocal support in Parliament as Leader of the Opposition. Some MPs were resisting a move to have Persad-Bissessar replace party founder and former political leader Basdeo Panday as Leader of the Opposition. Roget said amidst the feeling of euphoria, there were critical questions regarding how the system of governance would be changed. He said over the years there had been many political changes in the parties that have assumed the role of government. 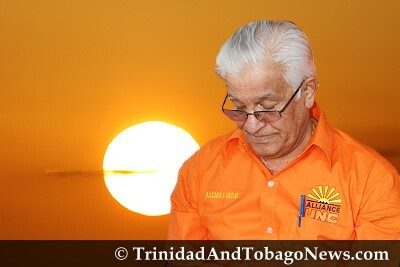 The results of the UNC internal election on January 24 were not simply a defeat for Mr. Panday but constituted a comprehensive repudiation by the party of the man and the politics he has come to represent. That is as it should be. Mr. Panday, at the end of his long career, had become not only an embarrassing liability for the party but a pillar of the old regime which the country must bring down if it is to have a chance at good governance and true democracy. But it was not always like this.